Group Accommodation at Stoke by Nayland Hotel, Golf and Spa01206 265835work Group AccommodationThe multi award-winning, family-owned, 4 star Stoke by Nayland Hotel, Golf & Spa resort offers a wealth of superb facilities for those wishing to escape to glorious Constable Country for a well-deserved break. Two championship golf courses, a luxurious spa with indoor pool and Decleor treatments, eighty stylish contemporary ensuite bedrooms and a two AA Rosette Lakes Restaurant are here to entice visitors. The renowned Afternoon Cream Teas are not to be missed! Five luxury, self-catered Country Lodges have recently opened where guests can combine the excellent hotel facilities with the privacy and freedom of an idyllic hideaway. 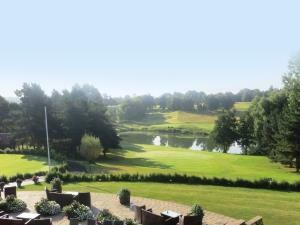 The multi award-winning, family-owned, 4 star Stoke by Nayland Hotel, Golf & Spa resort offers a wealth of superb facilities for those wishing to escape to glorious Constable Country for a well-deserved break. Two championship golf courses, a luxurious spa with indoor pool and Decleor treatments, eighty stylish contemporary ensuite bedrooms and a two AA Rosette Lakes Restaurant are here to entice visitors. The renowned Afternoon Cream Teas are not to be missed! January, February, November and December - £42.00 per person, per night. Single supplement £12.50 per night. March, April and October - £45.00 per person, per night. Single supplement £15.00 per night. August and May - £48.00 per person, per night. Single supplement £15.00 per night. June and July - £52.00 per person, per night. Single supplement £20.00 per night. September - kindly note group rates are not offered during September. Rates include a three course table d'hote dinner, bed and full English breakfast. All rates are inclusive of VAT.